If there must be just one A&E for Telford and Wrekin, Shropshire and mid-Wales, where should it be located? 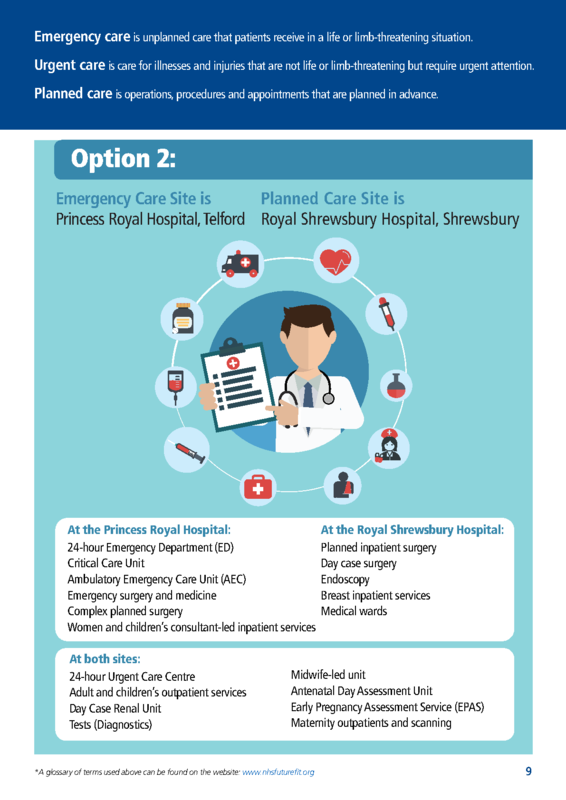 At the Princes Royal Hospital (PRH) in Telford or the Royal Shrewsbury Hospital (RSH)? This will be the main question asked in the Future Fit consultation on the future of Shropshire health services. We are expecting that to be launched in the next few weeks. There is a third option, that we keep both A&Es, though that will not an option health bosses will put forward in the forthcoming consultation. Let us know your views by voting below. I don’t need to tell you that the Future Fit restructuring of Shropshire health services is controversial. I don’t need to pretend that it will solve all our county’s health service problems. 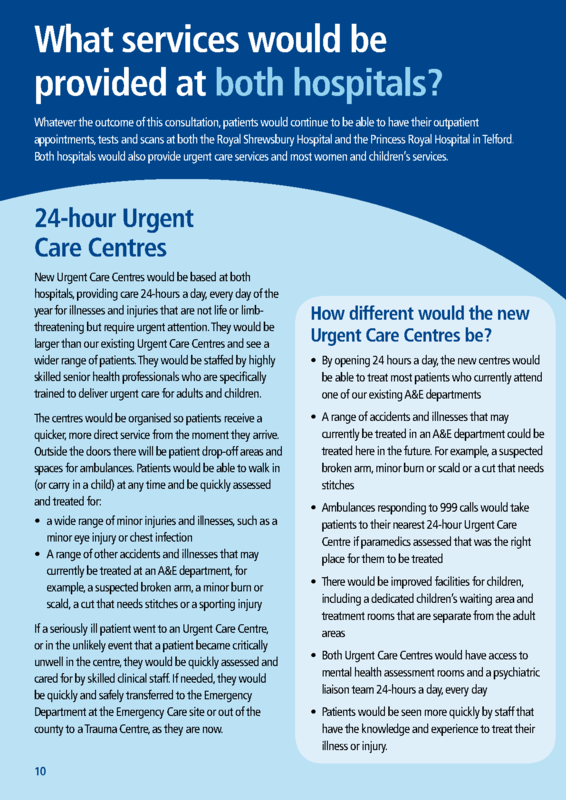 But the absolute reality is that a consultation on the options is just days away. It would be helpful if we could share views before the formal start of the consultation. That will help shape views within our community. These three images summarise the proposals. Click each to enlarge. Now it’s time to vote. Let everyone know what you think. As always voting is anonymous. There is space to comment at the end of this article. I allow anonymous comments providing that people respect the public and community nature of this blog. 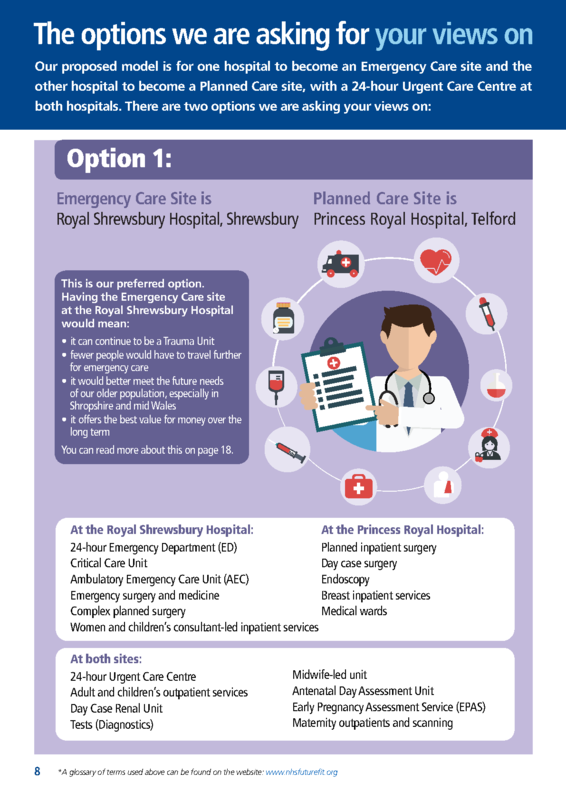 As one of your constituents, you will know that should I need life saving care, an A&E centre in Telford is not an option. It has to be Shrewsbury, purely on the grounds of distance and travel time. Let’s imagine a county which doubles it’s population and builds wonderful new manufacturing, service industry bases and contributes greatly to the area it is in. I think we need both for the reasons stated by others but have voted for Shrewsbury as it would be a disaster for the West of the county and parts of Wales if it closed. Personally living right at the South of Shropshire I will continue to use Hereford hospital wherever possible.